Today: There is a time and a place for garlic and its heady aroma -- that place is not on your hands. QueenSashy recommends rubbing your hands with vinegar or lemon juice. Melusine has found scrubbing with salt to be more effective than stainless steel. 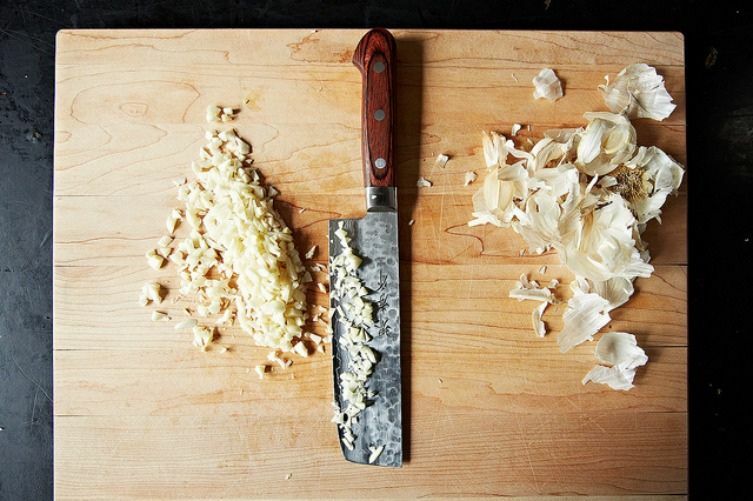 What do you think is the best way to remove the smell of garlic from your hands? Add your two cents to the question on the Hotline here or continue the conversation in the comments below! Wash you hands/knife/chopping board in cold water...must be cold, the colder the better. Beat me with a wet noodle, but I use a garlic press. No odor on the hands. One more for the stainless steel club! I rub my wet hands on the faucet after chopping onions or garlic and it works! I've found that rubbing my hand along the kitchen sink tap (faucet) and then washing with soap takes away the odour. Same with onion. Coffee grinds! I leave the grinds from my morning pot of coffee in the maker until later I do my dinner dishes in the evening. If I've chopped garlic, I grab a little handful of the grounds and scrub my hands with them. They don't seem to stain my hands, the coffee smell is gone after a minute or two, and the garlic smell disappears! Occasionally I've used toothpaste, but I never find that it works quite as well. I just rub my hands on my stainless steel sink. Works like a charm! Stainless steel works wonders. I just rub my hands on the interior of the sink with the water running! For some reason, "sink" stainless steel works much better than any steel implement you can find in your arsenal. It completely removes the scent, no need for a bar-soap thingy. Some may find it unsavory, but my secret to never having garlicky-smelling hands is to simply not wash my hands before handling the garlic. When you wash your hands you wash away your skin's natural oils. The same oils that prevent other oils and compounds from penetrating your skin. So, just don't wash your hands before you do anything with garlic, and make sure to cook your food at a temperature that would kill any germs. Simple. And actually, the same goes for handling hot peppers. As many seasoned cooks have (tragically) found out, if you wash your hands before handling hot peppers, there's a good chance your hands will burn for a few hours afterward. Trader Joe's lemon kitchen soap works great, my hands never smell like garlic or onions after washing with it! When nothing else works, rub your hands with toothpaste. I keep a dispenser bottle of lavender hand soap by my kitchen sink. As soon as I'm finished handling garlic, I run the hot water and wash my hands with it. Odor gone. As a first generation Italian, I cook with garlic often. My Nonna and Mammina would use a cut up lemon to wash our hands of the garlic Smell, works every time and smells fresh an clean too. I'm a fan of the stainless steel method. The blunt side of a table knife helps get under the nails where it tends to linger. I soak my hands in milk or yogurt. Leaves them incredibly soft, too.